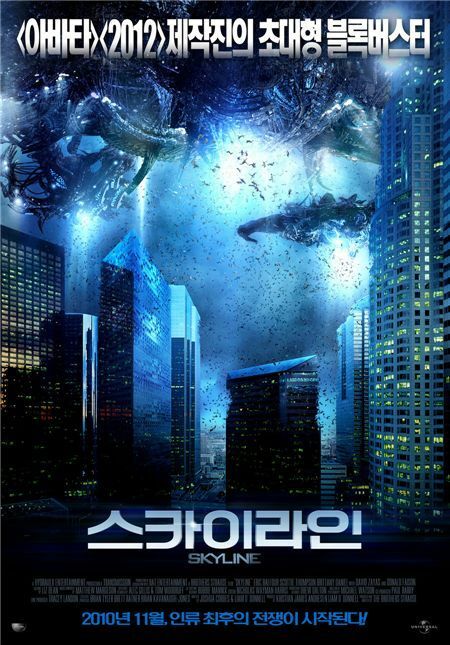 "Skyline", the new Sci-fi flick from the United States, claimed the No.1 spot on Korea's box office chart between November 26 to 28, according to data released by the official Korean Box Office Information System (KOBIS) on Monday. The story of alien invasion directed by Brother Strause, and starring Eric Balfour, Scottie Thompson and Donald Faison which opened in theaters on November 25, attracted 414,336 viewers during the three-day weekend period. Next in line was local film "Villain and Widow", another new entrant to the chart directed by Son Jae-gon which opened on November 24. A black comedy about a crook-in-disguise and a neurotic widow, starring Han Suk-kyu and Kim Hye-soo, sold a total 218,333 tickets during the same period. "Haunters" winner of the box office chart for the past two weeks, was pushed two steps down to third place. The film about an inevitable duel between one with a supernatural power and another immune to it brought in 151,045 movie goers in the third week. Other films that made it to top 10 were "The Unjust" that continued to remain within the top five slots for the fifth week, "The Social Network", "Foxy Festival", "Unstoppable "Let Me In", and the new films "The Concert" and "Due Date".